The big Cardiff weekend is now a speedway tradition dating back to the turn of the century. In recent years another tradition has emerged at this time of year - Jeff Scott publishes his latest book. His 2009 offering is entitled "Quantum of Shale - Round the Tracks" and, as before, is published under the Methanol Press brand. His 2008 offering 'Concrete for Breakfast' was nominated in the Best Biography category at the British Sports Book Awards 2009 and this has obviously given him the boost required to carry on with his writing. I'm sure that Jeff would admit that the critical acclaim his books have received has not (yet) been reflected in the sales levels. This is the fourth consecutive season that Scott has published a travelogue of his trips to the tracks. So many of the riders, promoters and tracks featured in his 2005 adventures are no longer part of the speedway scene that it's almost now a historical document. His books in general will certainly bear repeated reading in years to come and will offer valuable insights into the sport in the early part of this century. If you're familiar with Scott's earlier books then you'll know exactly what you're getting with this one, there's no dramatic change of concept or tone this time around. He simply tells it as it is, though this approach does seem to make him enemies as well as friends. His technique of quoting conversations 'verbatim' has always been controversial. Martin Dadswell from Eastbourne nurses a grievance about last year's book claiming "He's misquoted me again in it. I wouldn't call him numbnuts, would I? I'd call him a ****!". Brian Oldham is another that takes this up with the author - "You misquoted...I would never have said that. At least, I now know you write fiction." That Jeff includes these comments in the book shows that he's not above poking fun at himself as well as others. That last quote comes from the chapter on the Redcar v Workington meeting in July which is as good a piece of speedway writing as you're ever likely to read. It perfectly captures the stress that promoter Glyn Taylor is feeling in the build up to the meeting as his professional life appears to be spiralling out of control. He's an honest man in debt and actually being physically sick with the resultant worry about the future of his riders, his track and himself. That's not the kind of thing you would ever read in Speedway Star magazine, the reports they publish would likely extend no further than commenting on 'concerns' over the financial position. That's where this book comes into its own, it's engaging, brutally honest and tells you about aspects of the 2008 season that would have otherwise gone unreported. Strangely the weakest sections of the book are probably the descriptions of the racing itself, the insights gathered before and after each meeting are infinitely more interesting than the recap of the on track action. As always the coverage of the racing is mixed with the witty asides of the people standing around Jeff, many of them summing up the good nature so prevalent in speedway folk. During the 4TT at Workington an announcement concerning a window being left open on a Skoda solicited the following comment from one female spectator - "No one would want to nick that! Come on, the worst thing that could happen is that someone could throw litter into it!". A good line and one now captured forever, along with many others, within the pages of this book. Fittingly the book ends on an emotional evening in Berkshire as the Reading Racers staged the final meeting at Smallmead. The author first set eyes on the sport at that very same track and you suspect that the poignancy of the occasion affected him more than he lets on. Despite this he's still able to make a few acerbic comments about the odd flaws in the celebration that evening. If you've never read one of Jeff's books then start with this one and work backwards. It provides an insight into a world that you'll instantly recognise and introduce you to many of the characters involved in our wonderful sport. Fans of his previous books can rest assured that this is at least as good as what has come before it, perhaps even his best yet. It's thought provoking, funny and controversial in equal measure and a thoroughly enjoyable read. 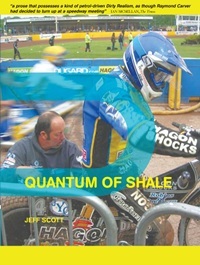 'Quantum of Shale' is available to purchase now from www.methanolpress.com and will be on sale at Cardiff on Saturday. How to buy "Quantum of Shale"